Join the Lake Forest Symphony on the red carpet for Opening Night of our 62nd Season On Saturday, September 21! After a pre-concert party, the Symphony kicks off its season with Prokofiev’s “symphonic fairy tale for children” Peter and the Wolf. In the second half Concertmaster Netanel Draiblate gives the world premiere of his new cadenza in Tchaikovsky’s landmark Concerto for Violin. Rimsky-Korsakov’s iconic and dazzling orchestral showpiece Sheherazade brings to life the tales of 1001 Arabian Nights. And Maestro Kulenovic and the Symphony present the premiere of Composer-in-Residence Jim Stephenson’s passionate and evocative new Symphony No. 3 “Visions”. Celebrate Valentine’s Day with the Lake Forest Symphony as Maestro Kulenovic brings the music of Broadway to Lake Forest! 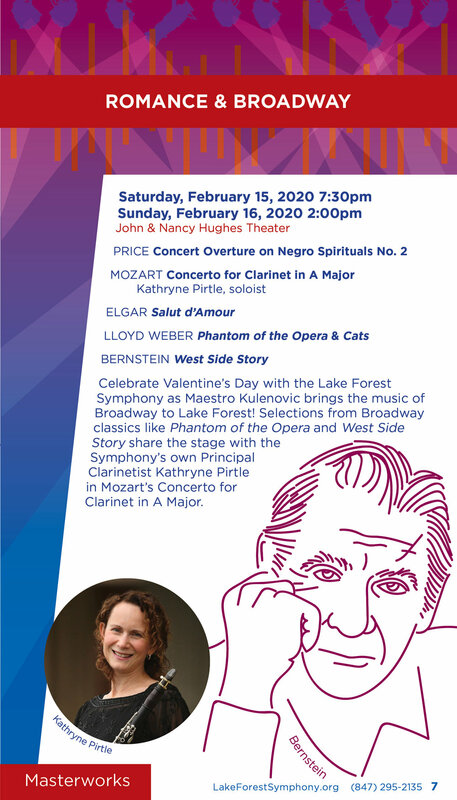 Selections from Broadway classics like Phantom of the Opera and West Side Story share the stage with the Symphony’s own Principal Clarinetist Kathy Pirtle in Mozart’s Concerto for Clarinet. All great composers learned from the prolific composers before them. Hear how these musical heroes inspired the next generation. Maestro Kulenovic gives the American Premiere of his father’s great work, Concerto Precipitato. Witness the grand finale of the season with Ludwig van Beethoven’s 250th birthday celebration! 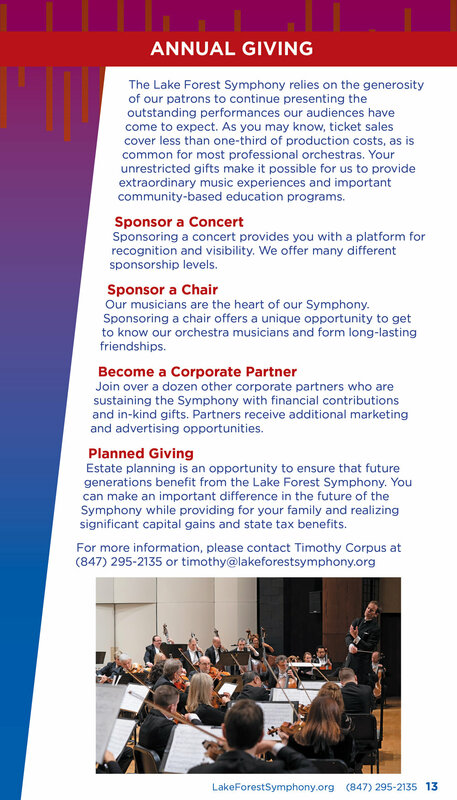 Beginning in 2014, the Symphony’s “Beethoven Symphony Cycle” has built towards this momentous occasion and the world premiere of the Lake Forest Symphony Chorus. This chorus brings together individuals from across Illinois communities focused on bringing Friedrich Schiller’s words, Alle Menschen werden Brüder “all people are Brothers” to life.